Michelin-starred chef Atul Kocchar has been fired for a tweet claiming Muslims have “terrorised” Hindus for thousands of years. The JW Marriott Marquis Hotel in Dubai dropped the chef after he posted the comments, aimed at Indian actress Priyanka Chopra. Ms Chopra has come under fire for a recent episode of her US TV show Quantico, featuring a plot about Hindu nationalists. The chef has apologised for the tweet. He has since deleted the message, and has pinned an image to his Twitter feed expressing his regret. But his Dubai restaurant fired the chef on Wednesday, after threats online to boycott the establishment for Mr Kocchar’s comments. “We pride ourselves on creating a culture of diversity and inclusion for our guests and associates across the hotel and our restaurants,” a spokesperson said. 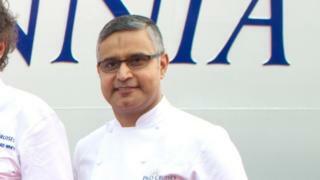 Mr Kocchar became the second Indian to earn a Michelin star in 2007 for his Benares restaurant in London. His tweet is part of a wave of online criticism directed at Priyanka Chopra, an Indian-born, US-based actress. Ms Chopra plays the lead character Alex Parrish in spy thriller Quantico, which broadcast an episode on 1 June showing the character foiling a terror attack in New York. Though the fictitious attack was ostensibly planned by Pakistanis ahead of a summit about Kashmir, the disputed territory claimed by India and Pakistan, Ms Chopra’s character discovers it is in fact Hindu nationalists trying to frame the Pakistanis. There was fury online after the episode aired, with some declaring Ms Chopra “an insult to India” and the episode an attack on Hindus. Ms Chopra has since apologised, declaring herself “a proud Indian”.